WHILE THE WORLD economy thrives on its ever-increasing carbon dependency, even the holdouts among skeptics are showing concern about global climate change and increases in greenhouse gases. Predicted scenarios of the effects of a diminishing supply of petroleum on global economies and politics range from grim to catastrophic. Fortunately, or unfortunately, depending on your point of view, methane, another hydrocarbon, shows great promise as the fuel of the future, but it may also play a significant role in climate change in its own right. Methane is a potent greenhouse gas with a global warming potential 25 times greater than the same mass of CO2. There is, however, a much greater mass of CO2 in Earth's atmosphere -- approximately 220 times as much -- and unlike carbon dioxide, methane is quickly destroyed by chemical reactions in the lower atmosphere. 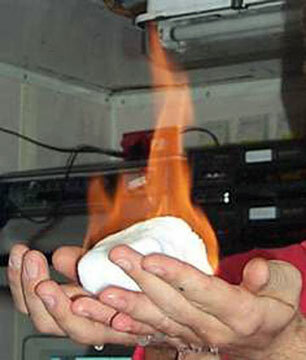 Unlike gasoline, methane burns "clean" to produce only carbon dioxide and water. This makes it an attractive fuel even considering its high carbon footprint. Methane is the major component of natural gas, which pipelines distribute throughout the continental Unites States for home and commercial use. Earth's crust contains massive amounts of methane gas, which most often occurs in pockets in sedimentary rocks in association with petroleum deposits. Under the right conditions it also occurs in an icy form known as methane hydrate. Methane hydrate is a crystalline solid that resembles ice in both appearance and composition except that it burns with an intense orange flame. A cage of water molecules surrounding a single molecule of methane provides the basis for the methane hydrate crystal. It requires low temperature and high pressure to keep the methane caged and to keep it and the ice from separating. Methane hydrate is common in the shallow marine environment, where it is under tremendous water pressure and the temperature of the water hovers at 28 degrees Fahrenheit or lower. It occurs both as outcrops on the ocean floor and trapped in deep layers of sedimentary rocks that were formerly shallow water sediments. It is not known for sure how methane hydrate forms, but research suggests that methane gas migrates from great depths along geological faults, and crystallizes when it comes in contact with cold water at the sea floor, typically in water depths greater than 1,000 feet -- where the water pressure may be 100 times greater than atmospheric pressure. Continental deposits are known less than a half-mile below ground in Siberia, Alaska and northwestern Canada. Known oceanic deposits are widespread atop the continental shelves in both shallow and deep sediments. Methane hydrate burns "clean," producing only carbon dioxide and water. Where it occurs near the sea floor, methane hydrate often cements loose sediments in a surface layer several hundred meters thick. These surface deposits may cap even larger deposits of gaseous methane underneath. Estimates are that the global reservoir is on the order of 400 million trillion cubic feet, which is nearly 75,000 times greater than the world's known natural gas reserves and equivalent to 1 million trillion barrels of oil. The United States Geological Survey (USGS) conservatively estimates the total amount of carbon bound in gas hydrates worldwide to be more than double the amount of all other fossil carbon in all forms: oil, gas and coal. Only about one-half of 1 percent of this lies within the U.S. exclusive economic zone. There is not enough data to accurately estimate how much methane can be extracted from the deposits, but 1 percent recoverability is thought to be a conservative estimate. Even at that rate it would more than double the current natural gas resource base of the United States. THE STAGGERING size of the global methane hydrate reservoir has caused serious interest in it as an energy source. Spurred by this, nations all over the globe are in various stages of methane hydrate research and development. In 2000, the U.S. Congress finally enacted the Methane Hydrate Research and Development Act, which Sen. Daniel Akaka had co-introduced three years earlier. The bill substantially increased funding and directed several federal agencies to work together to further understand methane hydrate and its resource potential. In 2002, an international team drilled three 3,900-foot wells at the Mallik Delta in the Canadian Northwest Territories. They found that gas production from methane hydrate was technologically feasible and in certain locations economically viable. At this writing there is no commercial production of methane hydrate anywhere. One of several remaining problems is that the sea floor hydrate resource is not well defined. It might occur as diffuse and discontinuous deposits of low concentration within fine-grained, low-permeability sediments. This would seriously strain its economic potential. No method has been developed yet to extract gas from the sea-floor sediments. No one knows how much is actually recoverable because the ice decomposes and releases its methane when it is removed from its high-pressure, low-temperature environment. There is no known way to safely transport large amounts of hydrate to production facilities on land, where the methane could be extracted. The problems surrounding methane hydrates go beyond merely developing the technology to exploit it. There are at least two important issues that need to be addressed. The first is that the location of hydrate deposits close to prehistoric landslides suggests that exploitation of sea-floor hydrate could affect the stability of continental shelves and slopes. This in turn could cause landslides that might damage existing offshore oil and gas facilities. There is also concern that the disruption of existing hydrate deposits by landslides could release large amounts of methane into the atmosphere. Global climatic changes may trigger the release of even greater volumes of methane gas, along with its strong greenhouse effects. Such changes can affect both the temperature and pressure at the sea floor. No one knows with certainty what happens after there are massive influxes of methane into the atmosphere. Past occurrences have coincided with both mass extinctions and rapid climatic change, most notably those associated with the oscillations of global glaciation and corresponding temperature fluctuations of the Pleistocene ice age. There are many suggested causes for global glaciation and expanding ice caps. Whatever the cause, once started it upsets the balance between atmospheric methane and methane hydrate. When sea level becomes low enough due to the growing ice caps that lock up water, pressures on the sea floor lessen and allow the release of enough gas to raise global temperatures. Overall warmer water reinforces this as it causes more methane to be released. The process is reversed as the glaciers recede until the system reaches an equilibrium. There are an increasing number of reports of large quantities of methane bubbling up to the sea surface as sea-floor deposits of hydrate decompose. Water tank research modeling has shown that these vast bubbles can sink even large ships under the right conditions, and may have been responsible for many missing ships. Methane hydrate may or may not be the fuel of the future, but its role in climate change and its associations with mass extinctions will keep scientists busy for a long time.